Here’s a quick test. Ready? Does your horse sometimes seem sluggish, gain or lose weight easily, or lose muscle over his top line but maintain a cresty neck? Does he stock up easily or sometimes seem prone to hoof soreness or abscesses? If your horse displays any of these symptoms he could be insulin resistant (IR), a condition that has recently come to the attention of many professionals and owners in the horse industry. Insulin is produced by your horse’s pancreas and is needed to move glucose out of the blood and into the cells where it can be used for energy. Some horses are genetically predisposed to develop a condition where their cells do not respond properly to insulin so glucose metabolism is impaired. However, not all horses that have this predisposition will develop insulin resistance. Triggers that can case this condition to manifest include high-carbohydrate or high-fat diets, mineral deficiencies, lack of exercise, obesity, and stress. Let’s look at each of these factors. Carbohydrate levels in feeds are best evaluated by looking at the non-structural carbohydrate (NSC) levels. Unfortunately, these levels are not listed on most feed bags but they can be obtained for most grains and hays at http://www.equi-analytical.com/. Some experts feel that a horse with IR should have a total diet that is less than 10% NSC. However, this low percentage is difficult to achieve as few feeds or hays have less than 11% NSC and they must be soaked to leach out the sugars to get levels this low. I feel most performance horses that are not showing serious symptoms, such as laminitis, and are still being worked regularly can handle NSC levels between 10% and 15%. 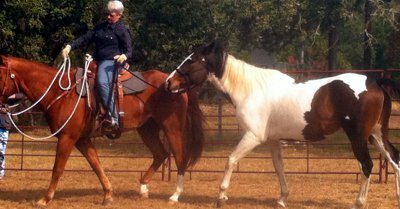 IR horses vary greatly in the amount of fat they can handle. In general the longer the condition has been active the less fat the horse can metabolize. Long standing IR will cause damage to the horse’s liver as the body tries to store the extra circulating glucose in the liver. This causes a fatty liver syndrome and the liver will swell, which blocks the bile ducts. Bile is needed for fat digestion and if flow of bile into the small intestine is blocked, fat will not be digested. In addition, the presence of fat will interfere with the digestion and assimilation of other important nutrients. I often suggest the herb milk thistle be given to horses that have IR because it has a protective effect on the liver. It also contains certain minerals, such as selenium, which help some horses cope with the muscle soreness that can occur with IR. I suggest one tablespoon daily of freshly-ground milk thistle seeds. Many minerals are important for carbohydrate metabolism, including but not limited to magnesium, chromium, manganese, and zinc. Mineral imbalances can also cause relative deficiencies if too much of one mineral interferes with the absorption of another. For example, magnesium and calcium use the same pathway for absorption so an excess of calcium can cause a deficiency of magnesium, even if the minimum requirement for magnesium in the diet is being met. The only way to definitely determine the mineral levels in your horse’s diet is to test all of your horse’s feed and hay. While this can be difficult it is worth the effort if your horse might be insulin-resistant. The website http://www.equi-analytical.com will give you the information you need to send in the correct samples. For horses that are not showing serious symptoms I prefer to look at the typical levels of nutrients in regional hay and feed samples; make sure the diet is balanced for macro minerals like calcium, phosphorus, and magnesium; and then use a food source that contains easily assimilated minerals, like blue-green algae, as a supplement to provide the micro minerals. Lack of exercise can affect the horse in several ways. First, it creates stress in many horses. Second, it contributes to obesity. Most diets designed for performance horses are based on keeping the horse at the correct weight when he is in work. As soon as the horse goes off work, either because of an injury or bad weather, he will start gaining weight if his feed is not cut. Third, exercise increases the cells sensitivity to insulin, even in IR horses. This is why we are able to give feeds with slightly higher NSC levels to performance horse in work. Obesity is a major trigger for IR. It is a sign that the carbohydrate intake of the horse has been higher than his need for a period of time. Excessive carbohydrate intake will increase the production of insulin, and continued exposure to high insulin levels can decrease the cells’ sensitivity to it. Obese horses are also less likely to exercise on their own. Last but certainly not least is stress. Horses are fight-or-flight prey animals and, as such, tend to release glucose quickly into the blood if frightened. In a natural environment, a frightened horse needs this glucose to either run away or fight. These activities quickly consume the glucose in the blood. Domestic horses under chronic stress have a similar fight-or-flight response and will experience the continued release of corticosteroids. This causes glucose levels to stay high and will keep triggering the release of insulin. The high levels of circulating insulin are the cause of many of the symptoms we see in constantly-stressed horses. To avoid this situation, get to know your horse and determine what stresses him. Avoid putting him in these situations whenever possible. If you simply can’t avoid a known stress, be there to support him. A horse that knows he is loved and appreciated can handle much more stress than one who is treated like a tool. To find out if your horse is IR you can have a simple blood test done that measures glucose and insulin levels, and then takes a ratio of glucose mg/dL divided by insulin mU/L. If this number comes out over 10 then you have nothing to worry about. If the number falls between 4.5 and 10 your horse is IR but is still compensating. If your horse falls in this category, you need to change his management (in terms of the factors discussed above) to prevent his condition from worsening. If the number is less than 4.5 then your horse is already compromised. If you do not immediately change his management, he could be at risk for laminitis. For this test to be accurate the blood that is collected must be centrifuged to separate the serum within 30 minutes to one hour, and then the serum should be chilled and sent promptly to a lab. If the blood is not handled appropriately it will give a falsely low glucose reading. In many cases the glucose and insulin reading may be within the normal range but the ratio will still show IR. The trick is not to wait for your horse’s lab readings to go outside the normal ranges before making changes in the way you manage your horse. Luckily, performance horses with IR tend to respond well to dietary changes. The main thing is to get the NSC levels down. Most sweet feeds contain 60% NSC so it is almost impossible to get the levels low enough. Oats are 50% NSC, making it a challenge to feed but it can be used in very small amounts if combined with grass hay plus alfalfa hay to bring the energy up. A diet of 3 pounds of oats, 3 pounds of alfalfa and, 12 pounds of grass hay would still have a NSC level of 18%, which is too high. A better diet would be 2 pounds of rice bran, 4 pounds of alfalfa, and 12 pounds of grass hay, which offers enough calories for a horse in light work and still has a NSC level of around 14%. This diet also has a 3.5% fat content, so it is not likely trigger any digestive upsets. Some feed companies are now recognizing IR and listing the NSC ratios of their feeds. If you want to simplify your math you can get one of these feeds and then test just your hay. If you don’t buy large amounts of hay you may be able to ask your supplier to test his loads as they come in and let you know the NSC levels of the hay you are buying. If you are not able to test your hay you can soak it for 30 minutes in hot water or one hour in cold to lower the sugar levels. This may seem like a lot of work but could make a big difference in your horse’s health!